A picture of bags of asparagus or Spargel in German, on display at the Saturday Farmers Market in Freising, Bavaria in Germany. If you are German you would recognize this vegetable on display at the Saturday Farmers Market in Freising, Germany as spargel but people in North America usually call this asparagus. This picture shows plenty of bags loaded with asparagus at the market in Freising, Germany with each row waiting to be bought by people that come to the market to shop. In Germany, asparagus is white in color as it is grown underneath the soil so that it is protected from photosynthesis. The end result when the asparagus is ready for sale is that it is still white in color and the flavour is much sweeter. Photo of asparagus or better known as Spargel in the German language, for sale at the Saturday Market in Freising, Germany. Pictures from photo gallery "Food Pictures"
This picture is part of the photo album "Food Pictures" - there are more beautiful images waiting for you. Spargel (asparagus) is extremely popular with the German people as there are festivals held when it is harvested where people celebrate its arrival. There are at least 57,000 tons of asparagus harvested each year but that is still extremely short as it is in such high demand. 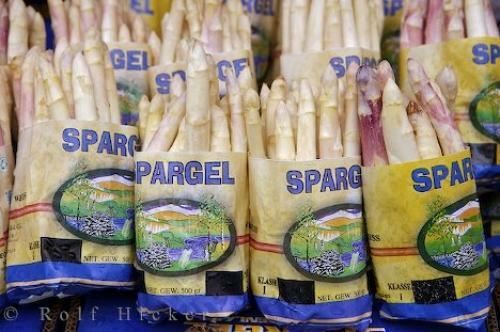 Next time you walk buy a market while in Europe and you see Spargel for sale, be prepared to buy some and enjoy the luxury of food that the German people do. If asparagus is really not one of your favorite types of food, at least take a picture of it and show the people back home as it is considered a treasure in the food industry in Germany. Asparagus (spargel) at the Saturday Farmers Market at the Marienplatz in Freising, Bavaria, Germany, Europe. I photographed this photo with the digital SLR camera model Canon EOS-1Ds Mark II, aperture of f/5.0, exposure time of 1/200 sec. on ISO 100, as always I used a original Canon Lens, the focus lenght for this picture was 60mm.